Courtesy of the State Library, New South Wales. Ben Jonson wrote two dedicatory poems to be included in the First Folio. 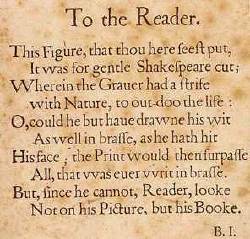 The poem reproduced here is set opposite the famous engraving which was published in the First Folio. In addition to this short piece, he wrote a long panegyric. It is worth reading with care. Jonson claims that there is no English author to compare Shakespeare with. He must be put with the greatest classical tragedians; and in comedy, Jonson says, he stands alone. Jonson also takes pains to mention Shakespeare's craft -- his "art"-- as if specifically to moderate his earlier criticism of Shakespeare's natural fluency. It is ironic in the extreme that the phrase that has led more than any other to the belief of some that Shakespeare was an unlettered--even illiterate--genius (or impostor) appears in a glowing tribute from one of the most learned men of his time.